Michelle Chu is from Kailua, O‘ahu. 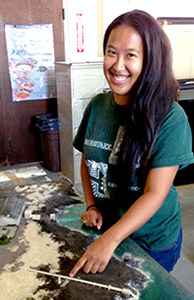 She will be a senior this fall at UH Manoa, pursuing a bachelor of science in Civil and Environmental Engineering. After graduating, she plans to pursue a master’s degree in Environmental Engineering, allowing her to work with coral reefs, the water environment, and the land environment. Michelle is particularly interested in wastewater treatment, and in using her strengths in math and science to help Hawaii’s environment. Project Abstract: Hawai‘i Ocean Science & Technology (HOST) Park, administered by the Natural Energy Laboratory of Hawai‘i Authority (NELHA), is an 870-acre facility providing opportunities in energy and ocean-related fields to their tenants. NELHA pumps and distributes cold deep seawater (DSW) from 2,000 and 3,000-ft depths and warm surface sea water (SSW) from an 80-ft depth, using five pump and booster stations. The stations collectively pump on the order of 35 million gallons per day to over 40 users. A model of the flow system of the seawater distribution pipelines was created using Microsoft Excel. The model uses monthly data from meter recordings. This user-friendly model makes the distribution system easier to understand, and it presents checks and balances to reconcile flow-meter measurements and alert the user to any discrepancy. The model also validates flow measurements with respect to past 6 month flow data.